Preparedness takes the form of plans or procedures designed to save lives and to minimize damage when an emergency occurs. Planning, training, and disaster drills are the essential elements of preparedness. These activities ensure that when a disaster strikes, emergency managers will be able to provide the best response possible. Disasters are caused by gale force winds, floods, releases of deadly chemicals, fire, ice, earthquakes and other natural and man-made hazards. When disaster strikes, the best protection is knowing what to do. 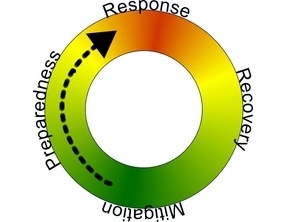 Response is defined as the actions taken to save lives and prevent further damage in a disaster or emergency situation. Response is putting preparedness plans into action. Response activities may include damage assessment, search and rescue, fire fighting, and sheltering victims. Recovery is defined as the actions taken to return the community to normal following a disaster. Repairing, replacing, or rebuilding property are examples of recovery.